Relax, clear your mind and prepare for a truly serene mobile slots experience. Inspired by the ancient Chinese zodiac, Dragon’s Zen online slots by PocketWin Casino combines relaxing reels with the chance to win yourself a fortune! You’ll find all 12 animals from the Chinese calendar in this 20-win-line spectacular, so will your zodiac sign help you to spin in some legendary wins? Whether you’re a rooster or a rabbit, a dragon or a dog, a snake or a sheep, fortune could favour you – especially if you can spin your way through the 8 Wheels of Wealth mini-game. For the brave of heart, there’s also a daring Gamble option, giving you the chance to risk your wins for greater rewards. Dragon’s Zen has an astronomical progressive Jackpot that will continue to climb until the stars align for one lucky player. Could your sign be the key to unlocking it? This mobile slots game is compatible with Android 5.0 and above and iOS 10.0 and above. Ready to become a zen master? It’s easy really! To get started, just press the ‘Bet/Lines’ button and then use the ‘+’ and ‘-’ symbols to increase or decrease your bet-per-line and the number of win lines you want to play on. These two values are multiplied together to give you your Total Bet! You can bet anything from 2p up to £5 per line, and as you alter your settings, you’ll see the amount in the ‘Total Bet’ box adjust automatically. For example, if you bet 2p a line across all 20 win lines, your Total Bet will be 40p. If you were to make it 10p across 10 win lines, each spin will cost you £1. Found a Total Bet that feels fortuitous? Click the white circular arrow to spin. If you’d rather sit back, enjoy the tranquility and let the reels do the work for you, you can enable the ‘Auto Spin’ feature. Click ‘Bet/Lines’, then ‘Auto Spin’ and you’ll see various options. As well as choosing how many spins you’d like, you can also set Auto Spins to stop if your credit reaches your chosen minimum level, or if you have a single win exceeding an amount you decide on here. Press the white circular arrow to set the reels in motion, and hit ‘Stop’ at any time to take back control. When you’re at peace with your settings, it’s time to start spinning! Hit the white circular arrow and the zodiac animals will spin, then roll in at random. If you line up enough matching symbols on an active win line, the fates have conspired to grant you a win! With some animals, just 2 or more matching symbols will be enough for a win, while with others you’ll need at least 3. You’ll find full details of the symbol combinations you need in the paytable – press ‘Menu’ and then ‘Paytable’ to access its wisdom! There are many mysteries in the realm of Dragon’s Zen, but one thing is crystal clear – win lines will always pay from left to right. Whenever a win is spun in, you’ll see the animals on your winning line come to life, and the amount you’ve won will be clearly displayed on screen. Your winnings will be automatically added to your credit before you take your next spin. Whenever you spin in a win, you’ll receive a multiplier of your original bet-per-line. Each combination of zodiac animals can grant you a different multiplier, so be sure to check the in-game paytable to find out what each one is worth. The only time you won’t receive a multiplier is if you spin in 5 Jackpot Rooster symbols on an active win line! Do that, and you’ll win the entire progressive Jackpot, regardless of what your original bet-per-line was. We won’t blame you for losing your cool if that happens! Destiny will only allow you to win once on each individual win line, which means that if you have more than one winning combination, only the highest value win will be paid. If fortune smiles on you and delivers a win on more than one line in a single spin, all of your wins will be added up to make one dragon-sized prize! We know that many people don’t like snakes, but you may want to make an exception for this one! Our Dragon’s Zen snake is the Wild symbol, and he can help you turn your fortunes around. He can stand in for almost any other animal, except for the Free Spins Dragon and mini-game Ox, to create a winning combination. If you were to line up two horses on an active win line with a Wild alongside, that would award you the same win as if you’d lined up three horses! The progressive Jackpot cannot be won with a Wild in place of a Jackpot symbol (you’ll need five rooster Jackpot symbols for that) but you’ll still receive a win worth celebrating. The Ox may not be the most glamorous animal in the Chinese zodiac, but it’s one of the ones you’ll want to look out for more than any other! Why? Because if you spin in three or more of them anywhere on the reels, you’ll get to play the 8 Wheels of Wealth mini-game. When the mini-game begins, you’ll get to spin the first wheel of wealth! If you land on a multiplier, you’ll win it and return to the main reels. If you land on ‘Next Level’, you’ll progress to the next wheel, where the multipliers available will be even larger! Keep landing on ‘Next Level’ and you’ll reach the eighth and final wheel, where a legendary win could be waiting! Here, you’ll definitely land on a multiplier, collect it and return to the game a great deal richer. Whenever you have a win below £1,000, you’ll have the option to enter the Gamble feature and risk your current prize for a larger reward. You can’t gamble wins above £1,000, which includes the progressive Jackpot. When you win, you’ll see the ‘Gamble’ button appear below the reels, along with a playing card. Click it and after a puff of smoke, a mystery card will appear. If you can guess the colour of the card correctly, you’ll double your win. Or, get the suit spot on to win a x4 multiplier. Feeling lucky? Choose ‘Joker’ for your chance to win a x26 multiplier if the card is indeed a Joker. When you’ve made your choice, press the button next to the suit or colour you want to go for, then click on the card itself. The card will reveal itself and if you’ve won, your total win will appear on screen. If you chose incorrectly, you’ll lose your original win and return to the reels. Right up until the moment you click on the card, you can always choose to click ‘Collect’ and keep your original win. If you spin in 3, 4, or 5 dragon Free Spins symbols anywhere on the reels, you’ll receive 3, 6, or 9 free spins respectively. Our blue dragon will snake his way on-screen for the duration of your free spins session. While he’s guarding the reels, you won’t be able to alter your bet-per-line or number of win lines. They’ll lock to the values of your last paid-for spin, but of course, they won’t cost you a penny. 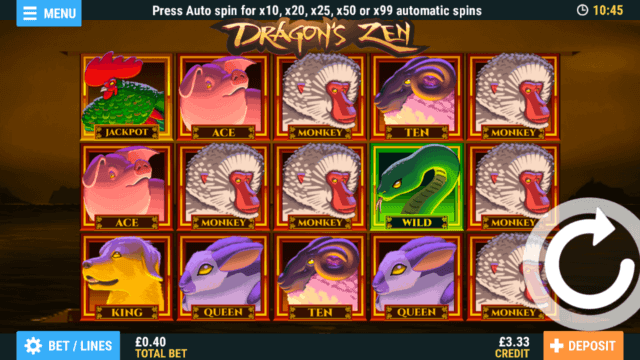 Dragon’s Zen online slots has a theoretical return to player of 94.8%. This is based on long term playback. System malfunctions void all payments. Monies are staked in the following order: winnings, player deposits, bonus credit.